Back in August of 2014 Matt Berger was a guest on the Modern Woodworkers Association Podcast. We were interviewing him in relation to his book, The HandmadeSkateboard: Design & Build a Custom Longboard, Cruiser, or Street Deck fromScratch. Though I wasn’t able to speak with Matt on the Podcast, I read the book and – though I’ve never skated – I fell in love with the idea of making a skateboard. The great graphic Matt made to share our interview with him on his site. When my cousin, Nick – a skater and skateboard enthusiast – announced he was engaged, I knew what I had to build as a wedding present. Looking though Matt’s book in order to decide which board to make, I vacillated between the Long Board and the Berger Board. The Long Board is what it sounds like, a long skateboard. It is flat and made from multiple strips of hardwood which are laminated to create a pattern. The Berger Board is a little more complicated. It’s made using bent lamination, using two layers of 1/8” Baltic Birch plywood sandwiched by layers of 1/8” shop sawn veneer. The veneer layers are made from multiple strips of contrasting hardwood to create a pattern similar to the longboard. 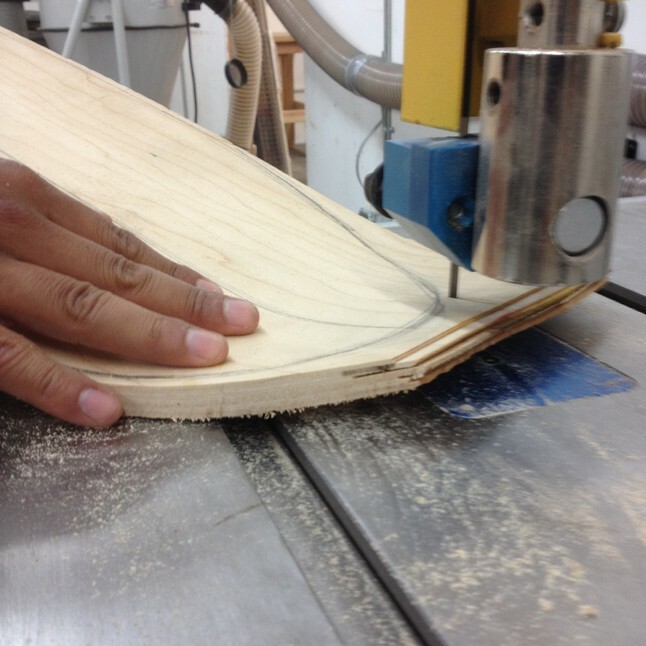 A photo of a veneer made board being cut to shape from the SK8MAKERS website. As I only had about 2 weeks to make the board after work and around soccer & Cub Scouts, I was leaning towards the simple and straightforward long board. Then I found myself buying the plywood to make the torsion box used for the bent lamination of the Berger Board, and off I went. I found the Berger Board an exciting and instructional challenge. It used shop sawn veneer and a bent lamination, both techniques I had never tried.